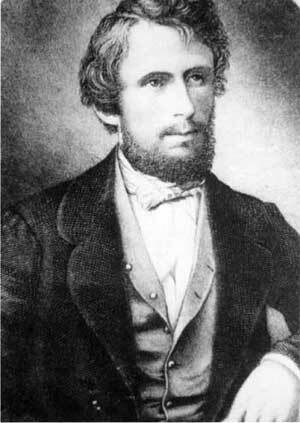 Ephraim George Squier (1821-1888) archaeologist, author, businessman, editor, and diplomat was born in Bethlehem, New York, June 17, 1821. He was the son of a Methodist minister. In his youth he worked on a farm during the summer and taught school in winter. At an early age he began antiquarian researches the results of which are among the most valued contributions to archaeology. As a young man he published the village newspaper and studied engineering. In 1841 and 1842 he was associated with the publication of the New-York State Mechanic at Albany. A year later he published a volume on the Chinese. From 1843 to 1848 he was again engage in journalism, first as editor of the Hartford Daily Journal, where he was instrumental in organizing the Whig Party of Connecticut, and later of the Sciolo Gazette at Chililcothe during 1847 and 1848, also serving as Clerk of the Legislature. In the later year he graduated at Princeton College. Henceforward he devoted himself to science. His first work of note was done in conjunction with Dr. Edward Hamilton Davis of Ohio, with whom he investigated the ancient mounds of the Mississippi Valley and published the results in the first volume of the "Smithsonian Contributions to Knowledge." At the request of Albert Gallatin, Mr. Squire prepared a "Memoir on the Ancient Monument of the West," which was published in the "Transactions of the Ethnological Society." Turning his attention to local antiquities, he published in 1849, under the auspices of the New York Historical Society, "Aboriginal Monuments of the State of New-York from Original Surveys and Explorations." In 1848 he was Charge d'Affaires to the Republics of Central America and negotiated treaties with Nicaragua, Honduras, and San Salvador. He visited Central America again the 1853, going as Secretary of the Honduras Inter-Oceanic Railway Company, and subsequently visiting Europe on behalf of the proposed enterprise, which was never accomplished. He subsequently published his "Nicaragua, Its People, Scenery, and Monuments," "Notes on Central America," "Waikua, or Adventures on the Nicaragua Shore," "The States of Central America," and "Monograph of Authors Who have Written on the Aboriginal Languages of Central America." A work of wider scope which attracted much attention was "Tropical Fibers and Their Economic Extraction." In 1856 he received from the Geographical Society of France a medal in recognition of his Central American researches. He was a member of various scientific and literary societies, and became editor of Frank Leslie's publications. In 1871 he became the first President of the Anthropological Institute of New York. He was appointed in 1863 United States Commissioner to Peru, where he traveled extensively during two years, examining and taking many photographs of the Inca works. Returning to New York, he began to prepare an exhaustive work on the subject, and portions were published in Harper's Magazine, but the completion of the work was interrupted by a mental disorder which clouded the remainder of his life. From time to time, he recovered sufficiently to superintend the publication of his last researches, under the title of "Peru: Incidents and Explorations in the Land of the Incas." Among other of his publications were "The Serpent Symbol," a paper in the Ethnological Society's collections on the remains at Stonehenge, and many contributions to the Encyclopaedia Britannica and other foreign periodicals. Ephraim George Squier died on April 17, 1888 at 6:30 o'clock in the morning at the residence of his brother, Frank Squier, 310 Lafayette-avenue, Brooklyn. His death was the result of a sickness of many years standing, which brought his scientific labors practically to an end 17 years prior. At his passing, E.G. Squier left no family. He was married to a lady who subsequently became the wife and widow of Frank Leslie. During his sickness he lived with his brother in Brooklyn.